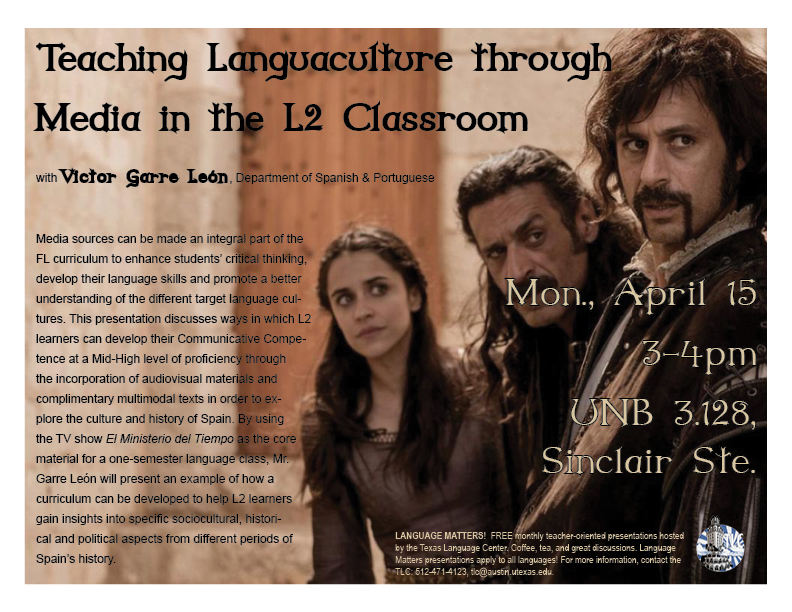 Join us for Victor Garre León's presentation on "Teaching Languaculture Through Media in the L2 Classroom," accompanied by coffee, tea, and great discussions! Media sources can become an integral part of the FL curriculum to enhance students' critical thinking, develop their language skills, and promote a better understanding of the different target language cultures. This presentation discusses ways in which L2 learners can develop their Communicative Competence at a Mid-High level of proficiency through the incorporation of audiovisual materials and complimentary multimodal texts in order to explore the culture and history of Spain. By using the TV show El Ministerio del Tiempo as the core material for a one-semester language class, Mr. Garre León will present an example of how curriculum can be developed to help L2 learners gain insights into specific sociocultural, historical, and political aspects from different periods of Spain's history. Language Matters presentations apply to all languages, so we hope to see you there!